HOUSTON, Texas (WPVI) -- Officers have found the bodies of all six Houston family members who were traveling in a van when it was swept off a Houston bridge and into a storm-ravaged bayou. Harris County Sheriff Ed Gonzalez says the van was discovered in Green's Bayou in northeast Houston. Gonzalez said the bodies of two adults were found in the front of the van, while the bodies of four children were found in the back. Devy Saldivar, 16; Dominic Saldivar, 14; Xavier Saldivar, 8; and Daisy Saldivar, 6, disappeared along with their great-grandparents while traveling with their dad inside a white van. Ric Saldivar is the uncle of the four children. His brother, Manuel "Sammy" Saldivar, was behind the wheel when he lost control of the vehicle. He says the family encouraged him to get the family out after the water began to rise around his home. Manny borrowed a van from a family member, and loaded his kids and their great-grandparents, Belia and Manuel Saldivar, inside. The family had just made their way over a bridge when the vehicle was caught in the swollen bayou. Action News reporter Chad Pradelli was and around Houston, Texas as the flooding crisis there continues. 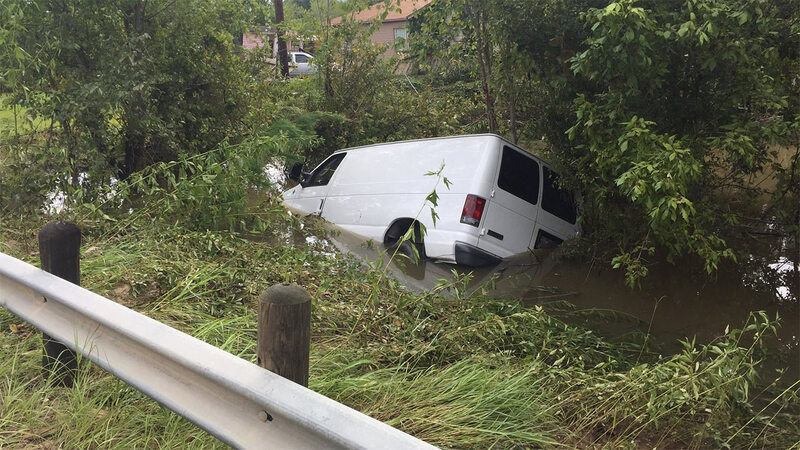 "The water picked the van up, and it was just floating after that," Ric said. "It went head first in, and water came in real fast." Sammy didn't have much time to think. Ric said Sammy managed to unbuckle his seat belt before pulling himself out a half-open window. The fast-moving water was strong, but somehow Sammy was able to grab onto something. "He called it a twig," Ric said. "A two-inch little branch." He then yelled for the kids to get out, but it was too late. The van was bobbing up and down in the floodwaters as the children screamed. Moments later, the van was gone, submerged underneath the fast current. "That keeps playing in his head," Ric said. For information on how you can help the victims of Harvey, visit this link here on 6abc.com.